Last night, I imagined the Queen's processional gown hanging on a hook in her bedroom, awaiting her morning fitting. As I fell asleep, Her Royal Majesty’s attire remained a mystery, the revelation of which I eagerly anticipated waking up to on this day's celebrations. At the writing of this post the merrymaking is long over, having passed while I dreamed of diamond tiaras and a happy Queen waving to her beloved people. For now, it is my job to capture my view of her beautiful outfit and the jewelry she wore. In keeping with tradition, her the morning celebrations began with a Thanksgiving Service at St. Paul’s Cathedral. The day ended with the pinnacle event: Her Royal Majesty's procession through the City of London in an open carriage. What a beautiful picture Her Royal Majesty made in her mint green tulle dress, embellished with dainty embroidered star-shaped flowers and silver thread. A stunning design by Angela Kelly, the dress features a mint chiffon scarf, sprinkled with Swarovski crystals, which elegantly cascades off her shoulders. Her smart hat echoes the same motif as the dress, complete with star-shaped flowers, silver embroidery, and Swarovski crystals dusting the mint chiffon accent. Upon her departure from the religious service, she waved her signature stately wave, sporting her practical black purse and shoes, her beautiful pearl necklace with matching pearl-and-diamond button earrings, and the magnificent Cullinan III and IV brooch. She received the necklace, a triple strand of white pearls, in 1935, as a gift from her grandfather, King George V, during his Silver Jubilee. The Cullinan diamonds were cut from one astonishing diamond weighing in at 3,106 carats (1-1/3 pounds). The Cullinan IV diamond serves as the upper portion of this fantastic brooch. This cushion cut diamond weighs 63.60 carats and was originally mounted in Queen Mary’s crown. It was cleverly designed to be taken out and used to form this brooch with its sister, the Cullinan III diamond. With a hefty weight of 94.40 carats, the Cullinan III diamond is the pear-shaped drop diamond forming the lower portion of the brooch worn by Her Royal Majesty for today’s Diamond Jubilee festivities. The Cullinan III and IV are referred to as "Granny's Chips," and this brooch was passed on to HRM Elizabeth II by her grandmother, Queen Mary of Teck, in 1953. When this brooch lies in state in the Tower of London, it serves as the finial piece in Queen Mary’s Crown. These two diamonds can also be worn together in similar fashion as a pendant on a necklace. 1. Official Website of the Queen's Diamond Jubilee, The. "5 June Events Announced." Accessed June 4, 2012. http://www.thediamondjubilee.org/5-june-events-announced. 2. Official Website of The British Monarchy, The. "Announcement of Diamond Jubilee events taking place on 5 June 2012." 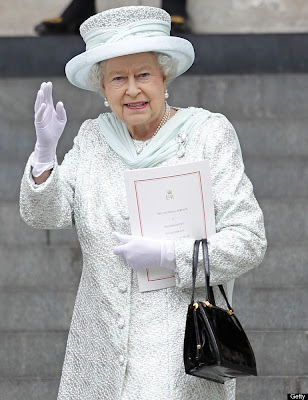 Accessed June 4, 2012. http://www.royal.gov.uk/LatestNewsandDiary/Pressreleases/2012/AnnouncementofDiamondJubileeeventstakingplaceon5Ju.aspx. 3. Marilyn's Royal Blog. "Question: The Queen's Pearls." Posted May 09, 2007. Accessed June 5, 2012. http://marilynsroyalblog.blogspot.com/2007/05/question-queens-pearls.html. 4. Vince, Jessica. "Kate Middleton in Alexander McQueen Dress and Jane Taylor Hat for Jubilee Service." Grazia Daily, June 5, 2012. Accessed June 5, 2012. http://www.graziadaily.co.uk/fashion/archive/2012/06/05/royal-repeats--kate-middleton-wears-alexander-mcqueen--the-queen-wears-angela-ke.htm. 5. World of Famous Diamonds, The. "The Cullinan." Accessed June 5, 2012. http://famousdiamonds.tripod.com/cullinandiamonds.html. 6. Internet Stones. "Cullinan Diamond." Accessed June 5, 2012. http://www.internetstones.com/cullinan-diamond-famous-jewelry.html.